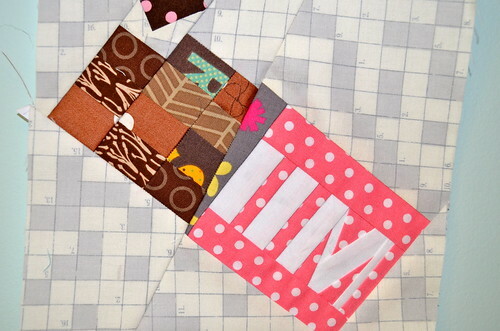 Well, you knew I couldn't stop once I was on a roll with the Super Penguin Quilt Along. 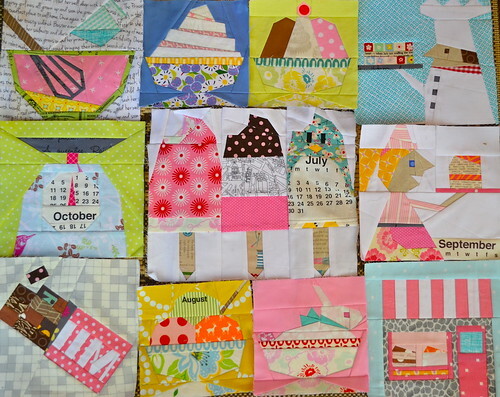 As soon as I downloaded my October blocks I started on them. I really love the blocks this month, Ayumi has really outdone herself (again!). I think the beater and mixing bowl are my favorite. I love that little pyrex-looking measuring cup. I'm also glad I finally got to use some of that text print from Madrona Road. I do love the story it tells, and am trying to find a project to use a big piece of it so that I can read the story in its entirety. So obviously this one has some problems! 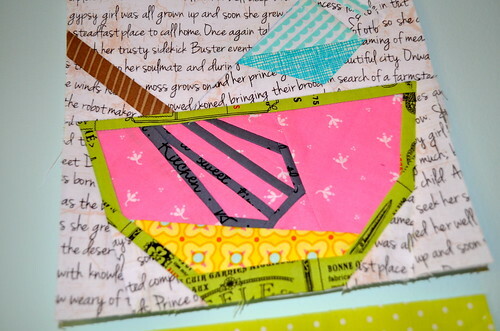 I think I may have mentioned all my foundation paper pieced blocks are mirror image because I sew on the opposite side of the paper as the rest of the world? Yep, not usually a big deal until you have letters to worry about. I pieced the chocolate portion first, so I would have had to start over to have "MIL" correct. I just laughed when I realized my mistake. Sometimes it is the best thing to do. Good thing I am not a perfectionist! In case you are wondering, it is a very fancy chocolate bar that someone brought me back from a far away land and that word is not even English. That's my story and I'm sticking to it. Here are all my blocks so far - four months worth. I can't wait to see what Ayumi has in store for November! Your blocks look fab. When you print you should be able to print 'mirror image' then your blocks would end up the same, not that it would normally matter! I'm so interested to know how you do it differently? I already told you how much I love how your blocks are coming together, but I wanted to say again how much I love them all! Love the story about the chocolate bar! I would do the same and keep as it is because it is so perfectly cute!